Burgers, kebabs, paninis and other arriviste lunchtime offerings, you need to up your game: for the ninth consecutive year, the jambon-beurre baguette remains, by far, the favorite snack of the French. 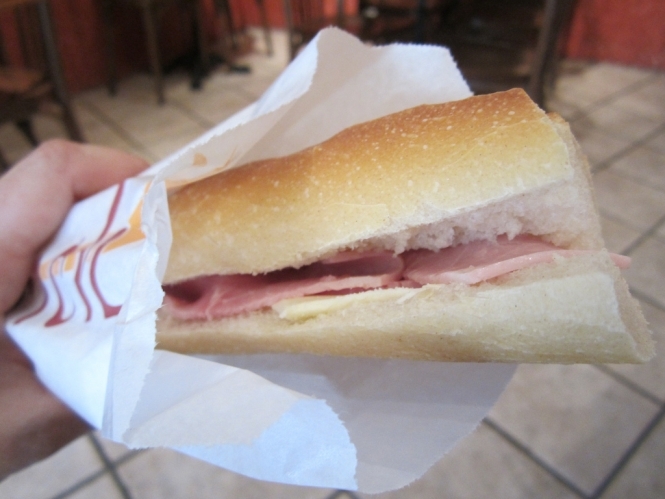 According to an annual study of consumption habits published by the Cabinet Gira Conseil, one in every two sandwiches bought in France last year was a butter-slathered, crusty baguette housing a couple of slices of ham. More than one billion of them were enjoyed in France in 2016 at an average price of €2.93 (up nearly 3% on the previous year). This price compared favourably with the average price of €3.51 for all of the 2.35 billion sandwiches bought in 2016 (this total was up 4% on 2015). It comes as no surprise that the cheapest place to buy your ham baguette is in a local convenience store (€2.30). Next cheapest is the supermarket (€2.51), then a service station (€3.02), sandwich shop (€3.12) and bakery (€3.23). The most expensive, equally unsurprisingly, is a bar, café or brasserie where a jambon-beurre will set you back €3.44 – but at least you get a plate to eat it from. The price of the jambon-beurre also varies according to where in France you buy it. And if you live on the western side of France, you will pay less for your lunchtime sandwich than if you live in the east. Rennes, Ille-et-Vilaine, is the cheapest place (€2.43); in Alençon in Normandy it costs just €2.61 and €2.68 in Cognac, Charente, while in Paris it costs €3.48. The priciest place to buy one, however, is Montbéliard in Doubs (€3.53), closely followed by Dijon, Burgundy (€3.42) – which illustrates a clear east-west ham baguette price divide. Such is the passion for the humble jambon-beurre that every year Le Figaro publishes its favourite places in Paris to buy one. There are many variables in determining the quality of a jambon-beurre and all French people have their preferences. Some like a few cornichons (tiny pickled cucumbers) inside to add crunch and tang but the biggest variable is the quality (and quantity) of the bread, ham and butter.